Donna Handel and Roberta Lyles didn’t like what they saw from their front porch on Third Street in Milwaukee’s Harambee neighborhood. Power lines with hanging sneakers screamed drug dealing. Gunshots went off like firecrackers at night. Foreclosed homes started outnumbering occupied residences. Litter lined a vacant lot in the middle of the block. Children played in the busy street. Handel and Lyles wanted it all to change. They envisioned a spot where multiple generations of neighbors could gather and socialize. Today when they sit on their front porch, they see the Cluster II Play and Grow Lot, a community garden and natural playground near Third Street and Concordia Avenue founded in 2007. These days, children play on tree cookies, which are painted tree stumps they can jump around on. They have tea parties and play games, while parents or grandparents garden in the beds next to the playground. 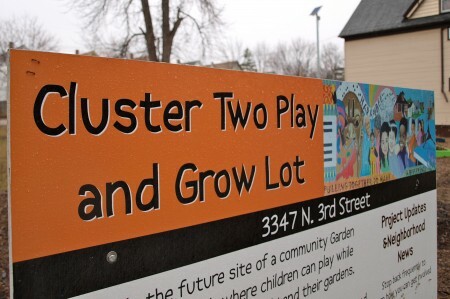 The Cluster II Play and Grow lot was a finalist for a 2012 MANDI (Milwaukee Awards for Neighborhood Development Innovation) hosted by LISC Milwaukee. Handel and Lyles teamed up with Groundwork Milwaukee, a non-profit organization that works to improve neighborhoods by creating community gardens. Mary Beth Driscoll, Groundwork Milwaukee executive director; Dave Mangin, operations director; and Antoine Carter, outreach coordinator for the site’s volunteer team, helped bring the pair’s idea to life. “They finished what they started – and that’s a very good thing,” Carter said. Handel and Lyles, who have been living together for 30 years, agreed. The garden provides benefits beyond better appearance and public safety. Vegetables such as tomatoes and string beans grow there. Lyles also created a summer program called “Rainbow Summer,” in which she teaches young children about what goes on in the garden. She added, “We’re trying to take the little ones from ages 3 to 10 and show them that there’s a different way to life.